Our expanded Employment Service Program provides members with training in work habits, filling out applications, using public transportation, and the nuts and bolts of work habits. A frequent issue for many is that of interpersonal relations on the job and how to handle changes in co-workers or supervisors. Other critical issues may be those of promptness and apparel. 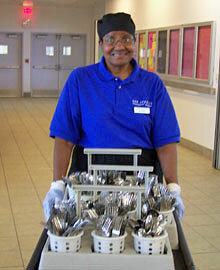 Some members have daily jobs at Corliss which helps prepare them for future work off site. 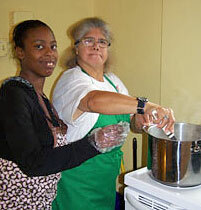 Corliss provides informal job coaching to those members needing assistance on the job, as well as full scale Supported Employment Services (through the Rhode Island Office of Rehabilitation Services) for those Members whose need for support and cueing will require more than two months of assistance. We have found that close to half of our Members can and do work with minimum supports and coaching once the job and schedule is understood. At the same time, Corliss is ready to resume supports, training and re-training when indicated and needed. At present, Corliss offers limited hours of on-site paid work for Members, work with the agency Recycling Project, access to off-site businesses and companies obtained through Supported Employment networks, and occasional work by area businesses that are in need of specific projects to be completed or positions to be filled. It should be noted that Corliss does not fund, offer or support Sheltered Workshop ‘employment’, and that any ‘work crews’ developed through agency projects are in the nature of training and skills acquisition only: our goals are for real jobs for real pay in integrated settings.